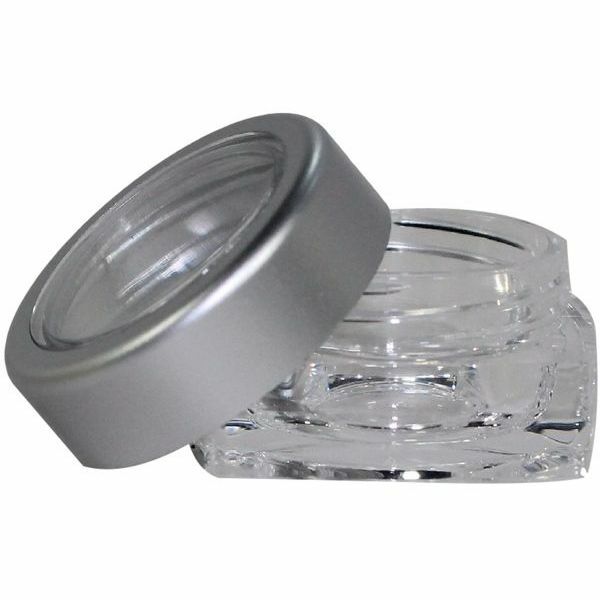 The clear polystyrene plastic square jars are available in a 5 ml size and feature silver caps with clear windows. These small square jars could be an elegant and unique packaging solution for lip balms or sample sized cosmetic products. This is a great lip balm jar for lip balms. My customers enjoy the beauty of this jar as well. "I really like this product. I mean talk about a modest size sample. There is enough to put the acne cream I made in here. It gives people the opportunity to know if it works and leaves them wanting more. Now with acne cream you surely want more time and so balm or salve would work even better in this one. Again the acne cream is just as good if you advised that they use it just on the skin that is breaking out. This is a perfect shape for a sample. I like the presentation and the silver tops."